This post contains the lecture notes I will be using in an honors level undergraduate class. Remember, the library offers a Business Research Portal. 1. Is there information on the Internet? Synthesis: Information (or more precisely: facts, opinions and data) is contained in documents. Documents may be posted on the Internet or published in electronic or print venues accessible through subscriptions or other forms of payment. A successful search for information implies thinking about (1) the motivations of those creating documents (e.g. : the goal) and their (2) expectations about posting on the internet or publishing in paid-for venues (e.g. : the source). 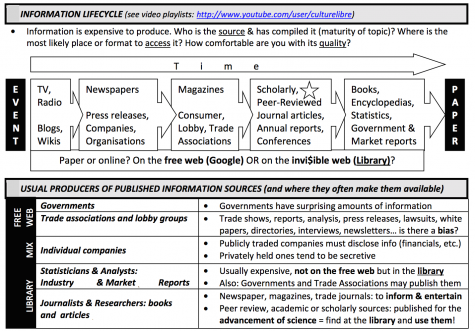 Synthesis: Structure & Editorial process of scholarly communication. This is a list of existing pages or resources on the library website about articles. Ce contenu a été mis à jour le 2019-01-22 à 1:56 pm.